As a decorative layer or soil amendment, cover garden beds with a 3cm thick layer and water well. 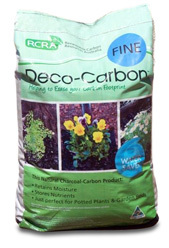 For a more traditional look cover Deco-Carbon with mulch. Deco-Carbon is available in 3 grades: Fine, Medium and Large for texture and appeal. Also suitable for potted plants. Increase soil carbon levels and crop yield using Carbon8.